1. Augmentation of Income from big properties:- Cases of valuable Waqf properties were taken up in the right earnest and the issues have been resolved, giving a boost to the income of the Waqf Estate and Waqf fund. As per compromise settlement in 2008 M/S Shaw Wallace Company Pvt. Ltd. is paying at present Rs.6,00,000/- per month to the Waqf Estate. A lump sum of Rs. One crore as one time contribution was finalized and paid at the time of execution of settlement. Earlier they used to pay Rs. 32,000/- per month. As per compromise settlement, Royal Calcutta Golf Club, Kolkata is paying Rs.1,00,000/- per month as rent to the Waqf Estate and have paid a lump sum donation of Rs.38,00,000/- . The settlement has already been executed. Tollygunge Club, measuring about 305 bighas of land. The properties had been leased out by the then mutawalli to Tollygunge Club. Now as per the order of Hon’ble High Court,Calcutta it has been settled at a monthly rent of Rs 1,00,000/- and one time donation of Rs. 32,00,000/- and the settlement agreement has been recently executed. a) Guest House under E.C. No 1040 MunshiAbdurRaufWaqf Estate. The construction work of one guest house at 9A, Lower Range with an estimated cost of Rs 18 lakh has been completed by the executive agency, M/S Mackintosh Burn Ltd and it will be operationalised very soon. This is a four-storied 2nd Muslim Girls’ Hostel at Kolkata, with accommodation capacity for 100 students. 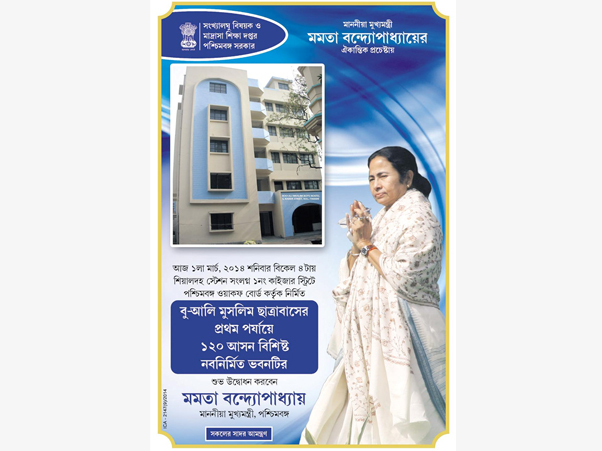 At an outlay of Rs.1.77 crores, the Hostel has been constructed by the P W ( S S ),Govt of West Bengal. Hostel has been inaugurated by Hon’ble Chief Minister, West Bengal, MAMATA BENERJEE on 28.01.2016 in presence of Hon’ble Chairperson, Board of Auqaf, W.B. Muslim Girls education has noticed a plausible progress in last several years. A host of Muslim girl students, poor but meritorious, has been undertaking higher education in esteemed institutions in Kolkata with sole aim to be financially independent, socially and culturally conscious. Of late, there was only one such accommodation available in Kolkata for poor and meritorious Muslim Girls from across the corners of the State, which can hardly cope with the ever increasing demand. With the completion of this Hostel, another lot of 100 Muslim Girls would be able to pursue higher education in Kolkata and become financially independent for the greater interest of the Muslim community at large. The construction work of the building with an estimated cost of Rs 8.55 crores has already been started in October, 2009. Block- A has been completed. An amount of Rs 2.70 crores has already been paid to the executive agency, M/S Mackintosh Burn Ltd. The hostel has a total seat capacity of 110 students. Block ‘A’ has been inaugurated by Hon’ble Chief Minister, West Bengal, MAMATA BANERJEE on 1ST March 2014 in presence of Hon’ble Chairperson, Board of Auqaf, W.B. The Board of Auqaf, W.B. has made an agreement with Gloria Builders for the development& renovation of the said Waqf Estate with certain terms & conditions. Such innovative developments will fetch more income to Board of Auqaf, W.B. as well as uplift the structural condition of the Waqf Estate. The matter is within the active consideration of the Board of Auqaf, W.B., Due process is being observed. Preliminary steps have been taken to proceed & permission for development of the said premises has been accorded by the Board of Auqaf, W.B. The Developer has submitted the Building Sanction Plan to KMC. The development of the premises will be beneficial in many ways. The matter is within the active consideration of the Board of Auqaf, W.B., Due process is being observed. The Board of Auqaf, W.B., has given permission to develop the premises with certain terms and conditions. The Developer has submitted the Building Sanction Plan to K.M.C. – Construction of a Community hall in Plot No-2184, area-0.58 acre. – Construction of Housing for Destitute women in Plot No-2185, area-0.79 acre. – Establishment of Educational Institutions such as NursingTraining, D.Ed&B.Ed and Law College in theHedayat Khan Waqf Estate vide E.C-11962 in the District Howrah is under active process. – A committee headed by Hon’ble M.P Jb. Sultan Ahmed has been formed by the Board of Auqaf, West Bengal. – Compensation money of Rs. 7,63,158/- has been sent to the D.M, Howrah for rehabilitation of the Bargadars. – The Construction of the boundary wall and other paraphernalia approval is under process. – The Board of Auqaf, West Bengal has taken initiative with full effort to promote Waqf matters for welfare of the general Public. – The Board of Auqaf, West Bengal has organized as many as 45 Awareness Camps in different districts of West Bengal in last Two years. (D) The construction of Shopping Arcades around Data Baba Mazar, Patherchapuri,Birbhum. – Project Cost of Rs. 7 Crores from the Waqf Estate fund. – No of shops to be constructed 225. – Work is going through BirbhumZillaParishad. – Organizing LokAdalat to settle the rent & other related disputes among tenants and Mutawallis. – Eight LokAdalats have been organized till date. – 209 cases have been settled &Rs. 23,47,188/- has been recovered at the spot and the total settled amount is Rs. 78 lac (approx). – The construction of Minority Bhavan at Malda has been completed. – The construction of English Medium Madrasha in the disctrict of Malda is going on.